Mounting injuries have taken their toll on the Edmonton Oilers, but as Devan Dubnyk notes, there will be no excuses from a team still focused on landing a playoff spot. Seeing players in and out of the lineup has been the unfortunate norm for the Oilers in 2011-12, with the club experiencing over 130-man games lost to injuries this season. Last year, the number was 279. For a team stocked with stellar young talent, in the form of Jordan Eberle, Taylor Hall, Ryan Nugent-Hopkins, Magnus Paajarvi, as well as veteran savvy, including Shawn Horcoff, Ryan Smyth and Nikolai Khabibulin, a strong start to the campaign has been slowed by a seemingly endless number of ailments. But in spite of the adversity, no one on the roster is waving the white flag or bemoaning their plight. Hungry for a return to the playoffs – the Oilers have finished last in the league the past two seasons – watching players skate in and out of the lineup isn't the formula to reverse those fortunes. That said, Dubnyk, the 14th overall selection in the 2004 NHL Entry Draft, notes nothing has changed in terms of the team's end goal. 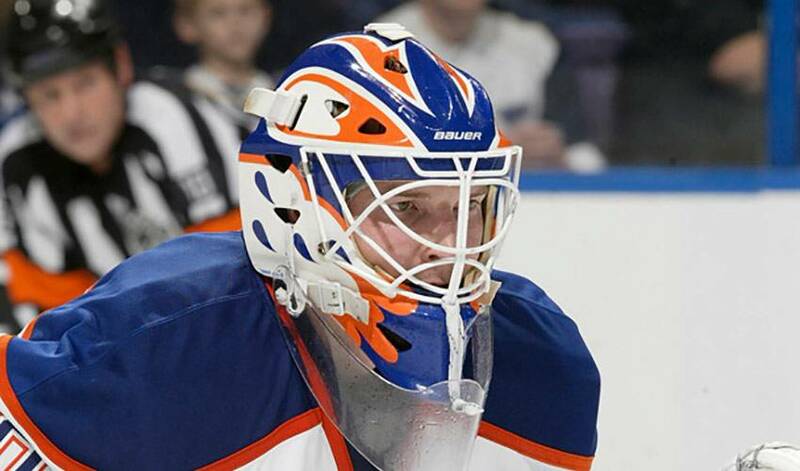 Dubnyk, a graduate of the Western Hockey League's Kamloops Blazers, who was named the 2004 Canadian Hockey League Scholastic Player of the Year as the major-junior player best able to combine success on the ice and in school, hasn't resorted to drastic measures to ensure he remains healthy. As for what he's looking to contribute as the second half of the season looms, Dubnyk, who won his first NHL game on March 19, 2010, recording the first regulation win of his career two days later in a 5-1 victory over the San Jose Sharks, is hoping to be at his best when called upon. Having the support of his goaltending partner has also been a huge plus for Dubnyk. “It's been great,” he said, of their relationship. “I consider him a good friend. It's by no means a student/teacher type of situation, but rather two people who want the best for one another. The only thing that Dubnyk would ask for, however, is a reprieve from the injury bug that has decimated the Oilers' lineup. He either leads the league or ranks near the top of the list in a number of statistical categories, but all-star goaltender Devan Dubnyk remains the ultimate team player.